I love love love handbags. I have been known to search the purse aisles of TJ Maxx and get pretty sweet deals on nice purses. I have 2 purses that I use on a daily basis & I love them. 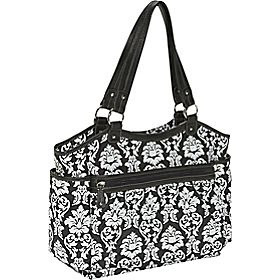 Now I need a diaper bag that I am in love with. If I am carrying it on a daily basis...shouldn't it be an "in love" kinda relationship? I think so. This is what I have found so far.. I really like this one. It is the Stone Mountain Jackie bag. I pretty much love the pattern...kinda want to make it into wallpaper. The black one is by OiOi. I may or may not be partial to this bag just because the brand is fun to say. "What kind of bag do you have?" "OiOi!" Seems fun. Pretty affordable. Quilted=easy to clean. This is also by Timi and Leslie & is the cheapest of all the ones I have liked! I like this blue & brown one...but would probably get the brown & cream one. Ya know...if we have a girl (fingers crossed) down the road. Okay...I need help. 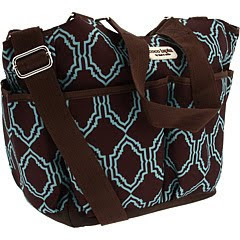 To all the mamas: what in the world do I need to be looking for in a diaper bag? What do you have? I want practical & attractive...which seems to be an issue. :) Help! I am not a mama, but I LOVE the Timi & Leslie one! Well, I'm not a mama. But, my co-worker is a new Mom and swears by the Skip Hop bags. I didn't even know it was a diaper bag! It's so stylish and cute, yet entirely practical. The roomier, the better! I just had a little girl in December and I had to give up the cute boutique bag I received as a gift and go with a more generic tote. There are so many things you have to tote around that you don't even think about - apart from the diapers, wipes, and bottles (toys for entertaining when they get older, extra clothes - just in case, jars of baby food when they start solids, baggies for messy diapers when you're not near a trash can, clorox wipes for disinfecting restaurant tables - they make great travel size packs!, tide to go pens, etc). I say go for the roomiest bag! You won't be sorry. Good luck! 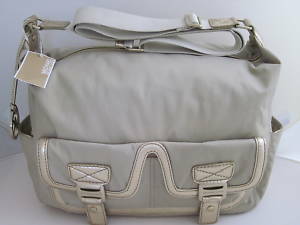 I have an OiOi bag that I bought for $150ish dollars (had a $100 gift certificate). I would HIGHLY suggest getting a "name brand" one because they are made with everything we moms need. Yes they are expensive, but it is going to be your only purse for 2 years! I agree with the roominess part. You will throw everything in there. 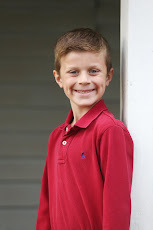 I know it's been a while for me, but I never expected mine to last through more than one child. Are we counting on that these days? Are they made better, or is because of the price? discuss.. If not, then it doesn't matter if it's boyish. My favorite is the Michael Kors. Ha! (OK, the quilted). 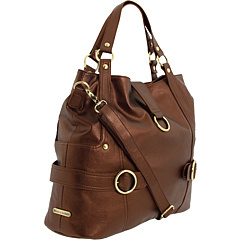 I love the Timi and Leslie bag because it doesn't look too diaper bag-ish.. if that makes any sense! I had a Vera Bradley diaper bag but if I had to do it over again I'd do something more along the lines of the Timi and Leslie ones. Have you ever heard of 1154lill? It's a great store in Chicago (and a few other places) but you get to DESIGN your own bag and they have Diaper bags!!! I'm a little behind on this comment because now that I'm working I have less time to stalk your blog! I bought mine a few weeks ago at the Kate Spade outlet and LOVE it. It was originally $395, but I got it for $107... I love a good deal. They had a ton of styles to choose from, so if you have a Kate Spade outlet nearby check it out.